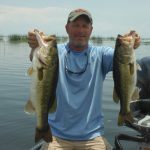 This week on Lake Okeechobee the winds have been light and the water temp has been in the low 90’s at times and the water clarity has been pretty good throughout the lake. The BEST BAIT for me is still the Strike King Swim jig in the morning but the Reaction Innovations Trixie Shark has caught the bigger fish, color does not seem to matter. After the morning bit is over I have been flipping a new jig, it’s the Odom (I Max) Jig in 1 oz. the best color is still Black/Blue. In Pencil grass/ Kissimmee grass but you need a little Pepper Grass in there too. Good areas to fish are Kings Bar, Tin House and J&S. Here is a picture of my buddy Rob with a couple of fish we caught this week. You can check the water Level of Lake Okeechobee atwww.okeechobeejust4bass.com.